It was a treat to reread Geoff Ryman’s “What We Found” to prepare to write this column. As I noted when I wrote about this story for my review on the issue of F&SF in which it originally appeared, Ryman has been writing in recent years of third-world cultures, in such a way that the reader becomes immersed in the culture, surrounded by sights, scents, tastes and sounds of a world so foreign to a first-worlder that it might as well be an alien civilization. This time, the setting is Makurdi in central Nigeria, a city with air conditioning, solar panels, smartphones — and roosters crowing outside the window on the morning of the narrator’s wedding day. As Patrick tells his story of his strange scientific findings and their decay, the apparent effect of observation, he also tells the story of growing up with a father who slowly lost his mind and a favorite brother who followed suit. The tale of a family riven by madness, unkindness and poverty is sad but fascinating. As the implications of the narrator’s scientific findings start to seep through the pages to the reader, it seems that everything comes undone at the same time that it is stitched up. While the nominees for the Hugo Award for best novelette this year are all good stories, “What We Found” is clearly the winner in terms of sophistication, subtlety, elegance and skill. If you read only one of the novelettes discussed in this column, make it this one. Charlie Jane Anders wrote the fascinating “Six Months, Three Days,” about a relationship between the only two clairvoyants in the world. Both of them know exactly when and how their relationship will end — badly — but each chooses to proceed with it regardless. Doug does so because he feels he has no choice. His life, he believes, has been predetermined, and he is merely following the steps already laid out. Judy, though, is precognitive in a different way: she sees her choices and the branches that would follow from each possibility. Doug and Judy argue frequently about whether they have free will, and it is their differences on this score that, ironically, is the basis for their ultimate break-up. It’s a cool idea for a story, and Anders writes it well. I also really liked “Sauerkraut Station” by Ferrett Steinmetz, though it offers little in the way of new ideas. Lizzie is a 12-year-old child who is one of three crewmembers on a small space station that serves as a sort of pit stop for interstellar cruisers. Lizzie befriends a younger boy named Themba when he passes through the station on his way to serve as a hostage for one of two empires; the friendship between the two of them is immediate and deep. When war erupts, the station remains neutral, providing services to soldiers from either of two vast forces — including medical services, as Lizzie is apprenticed to a physician and proves to be a quick learner. The war becomes one of attrition, and the station is ultimately seized by one force, and it is at this point that the story truly becomes one of survival. The description of Lizzie’s battle to keep not just her home, but her life, is exciting. Jake Kerr was being sly when he named his story “The Old Equations.” This story depends on the reader’s deep knowledge of science fiction and assumes a fundamental understanding of physics for its full effect. The title of the story is a take-off on Tom Godwin’s famous — some would say infamous — short story, “The Cold Equations,” which stands for the proposition that no amount of intelligence, charity or wishful thinking can get around the hard science of the universe: when a fuel supply will only get so much weight just so far, nothing will change the math. Kerr posits a universe in which Einstein died in World War I, after having published his revolutionary paper in which he revealed that E=mc2, but not breakinig through with this news into the physics community, which dismissed him as a crank. Rather than working from that equation, then, science instead discovers and becomes enthralled with quantum mechanics and undertakes to explore space. When an astronaut takes off on a five-year voyage, certain old equations reassert their authority. It’s clever, but a bit too pleased with its cleverness. I’m also not sure whether it makes any scientific sense; how could you have the science to launch a spaceship, but never have stumbled over the speed of light as a cosmic speed limit? 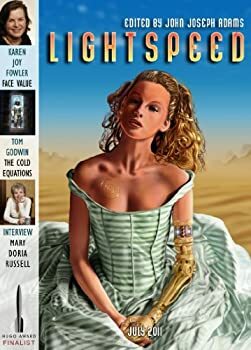 “Ray of Light” by Brad R. Torgersen is another hard science fiction story, this one first appearing in Analog. Humanity has been forced to relocate to the bottom of the sea when an alien race, without a word of communication, much less explanation, sets up a shield of mirrors to prevent sunlight from reaching the Earth. The extreme cold on the surface of the planet forced humans to live near the boundaries between tectonic plates, where hydrothermal vents provided sufficient heat. Since then, no one has returned to the surface; it’s impossibly far, and the layers of ice too thick even at the equator to make it worthwhile. But the younger generation refuses to accept the prospect of a life totally without sunlight, and takes matters into its own hands. The story is predictable and ultimately trite in its resolution, even if its premise is imaginative. Life after death has always been a fruitful area for speculation for writers. Rachel Swirsky writes of one possibility for an afterlife in “Fields of Gold.” Dennis finds himself “in another place” after he dies, with dead people coming toward him with party hats and presents. It’s a strange party, with not only the family and friends who predeceased him there, but also Cleopatra, Napoleon and Shakespeare. It feels rather like a big high school prom, only the punch is legitimately spiked and the music is good. Dennis meets up with the cousin he was in love with when he was a kid, and has a long talk with her father, his uncle. And he learns that he didn’t arrive on The Other Side in quite the way he expected. It’s a strange fantasy that suggests (as so many stories do) that the best of life is left behind in our childhoods when we grow up. Fortunately, if Swirsky is right, Heaven makes up for that. Perhaps Geoff Ryman’s story was so excellent that it cast a long shadow on the other nominated stories, because generally speaking I found the other nominated stories competent but not outstanding. 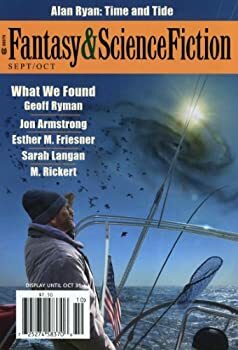 I’m terribly disappointed that Ryman’s is the only nominated story that does not appear to be available on line — but you can find it in the September/October 2011 issue F&SF or the just-published Best Science Fiction and Fantasy of the Year 6, edited by Jonathan Strahan. As the story has also been nominated for the Hugo Award, I’m hoping F&SF will ultimately decide to post it online, but really, it’s worth purchasing a copy of the magazine just for this single story.